Reading through the blogs I follow, I realize how so much of North America is suffering through a bone chilling winter. At times like this we need food that is nurturing as well as nourishing. After a bitterly cold day there is nothing more satisfying than coming home to a steaming hot bowl of soup to thaw out your frost-bitten fingers! So this week I offer you a lovely, complex concoction that originates in Africa. 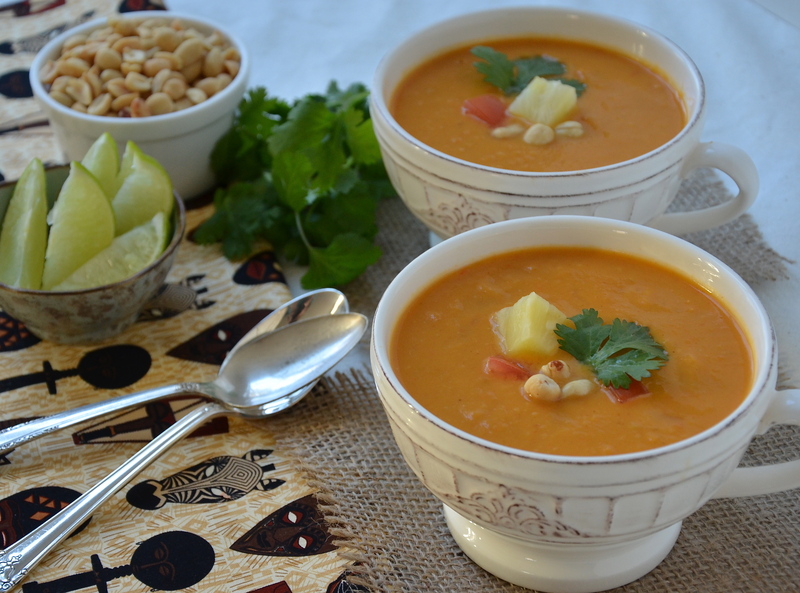 If you have not yet tried a yam and peanut soup, you are in for a treat. For those of you familiar with this combination, this recipe has the added twist of pineapple and it includes a generous amount of fresh ginger to stoke up the heat. A bowl of this soup, served with a thick slab of sourdough or a dense rye makes a substantial meal. This soup can tolerate a good quantity of hot sauce, so go for it – this is the soup for a good splash of your favourite sriracha or habañero. I found the recipe in the must-have Canadian cookbook I have mentioned before: Rebar: Modern Food Cookbook by Audrey Alsterberg and Wanda Urbanowicz. I hope you enjoy it, and please keep warm! Place the olive oil in a large soup pot. Add onion and salt and sauté over medium heat until the onions are translucent. Add ginger, garlic and spices and sauté until fragrant. Add stock, bell pepper and yams and bring to a boil. Reduce heat and cover. Simmer over low until the yams are cooked. 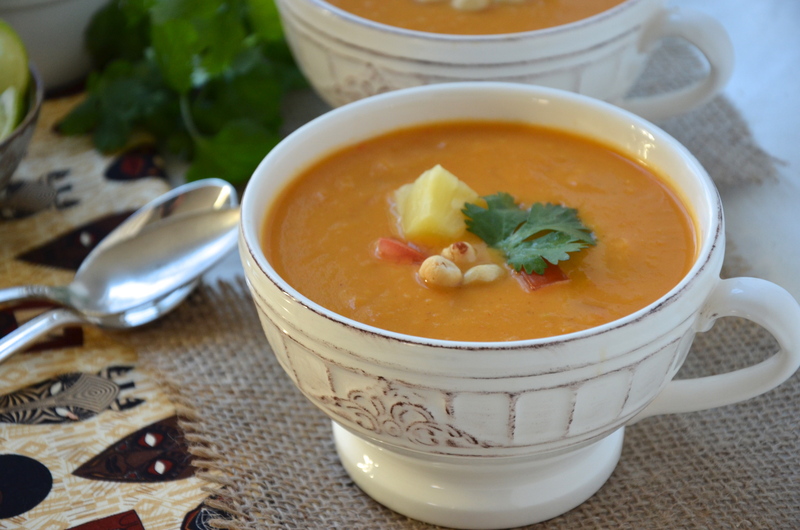 Add pineapple with its juice, tomatoes, peanut butter and simmer for another 30 minutes. Remove from the heat and purée with a hand-held blender until the soup is mostly smooth, leaving a few chunks for a bit of texture. To serve, pour into bowls and top with chopped cilantro and lime juice. You can garnish with a bit of extra chopped peanuts, some extra pineapple and your favourite hot sauce. Smile and enjoy this sublime soup! The rebar cookbook is one of my absolute favourites. What creative chicas that Audrey and Wanda are. (Have you tried the chocolate cake recipe?) I am very happy to be out of the colder part of the country now, but I definitely feel for those prairie provinces and east-coasters that are still getting it hard, I hope they discover this post. Oh, I am so glad to know that somebody else loves this cookbook as much as me!They are amazingly creative chicas and I try to hit their restaurant any time I am in Victoria. No, I haven’t tried their chocolate cake recipe, but I will for sure, based on your recommendation! Glad to hear you made it out of the deepfreeze and I just wish I could send a few big pots of the soup out their way! Cheers! So glad you think so! It is a lovely soup for a cold winter’s day! Thanks so much for stopping by my blog and taking the time to make a comment! cheers! This soup is calling my name! I’m always stuck on recipes to feed my vegetarian sister. This looks like my solution! So glad to hear! I’m sure you and your sister are both going to love it. Let me know what think! Miam, elle a l,air délicieuse cette belle soupe! Merci Catherine! On adore cette soupe chez nous! African is something I rarely try, mostly because I never see recipes. Thanks for this. How did I miss this wonderful soup? It looks so good and the presentation is remarkable. I love the photos. And the addition of ginger and pineapple. What a unique combination! This I would like to make as soon as possible! !